Myths about the Great Depression were once a mere annoyance. Now they have become a source for tyranny. The Bush-Obama response to the meltdown proves that one thing is certain: until we get the history of the 1930s right, liberty will be under threat of those trying to repeat the drama. Thank goodness Robert Murphy has come along to straighten out the mess in a way that everyone can understand. In this hard-hitting book, we find the most accessible and most truth-telling book about the Great Depression and the New Deal that has ever been written. Free-market economists have been working for decades to make the record of the calamity clear. This book may just be the magic bullet we've been looking for to kill off the myths before they kill us. He puts together in one easy package the research of hundreds of scholars, showing that it was not capitalism that failed in 1929 but the boom times created by Fed credit expansion. Murphy takes aim at the Chicago School economists and the Keynesians who continued to be in denial on this central point. A particularly great feature here for Austrians dealing with monetarist myths: Murphy explains that the deflation in the 1930s didn't have to be somehow devastating. It was not egregious by historical standards, and was fully compatible with economic growth. In fact, the Fed tried but failed to flood the economy with money in the 1930s. Here Murphy provides a very compelling explanation of fractional-reserve banking and its effect on the supply of money. He further shows that Hoover was not a free-market president. His policies were so statist that he might as well have been a Soviet agent. His biggest critic, who blasted him for his spending and centralization, was none other than FDR. But once FDR came to power, he enacted the longest string of cockamamie, prosperity-killing measures of any president in American history. The economy still hadn't recovered going into World War II, a war that didn't help the economy or get us out of the Great Depression. It prolonged the government-made pain. Murphy dissects the real history here with facts, analysis, clear prose, suggestions for further reading, fantastic quotations from all the main players, and even when he is discussing complicated data, he never leaves the reader behind. Murphy concludes his book by recounting what led to the current crash. And wraps it all up with an excellent criticism of Bush-Obama and predicts that their policies will prolong problems. This book appears as part of Regnery's "Political Incorrect Guide" series but, in fact, this account is not biased in any particular direction. It is just good history, accurate history, truth-telling history that we have to know to navigate the treacherous waters of today's economic and political environment. Capitalists everywhere should have this on their bookshelf and in their briefcase. Buy this book, read it, arm yourself against the falsehoods of the enemies of free market and liberty. This is a great intro book to give your non-enlightened friends. Terry Fraser (other reviewer) is a moron. I struggle with rating this book poorly, as I believe everyone should read it. As opposed to recognizing the critical elements that the New Deal represented in rebuilding our nation both socially and economically, this drivel seeks to recast it as a failure. The New Deal built the middle class of America. There are many factual books on this topic to read, or you can read this one, which reinforces that if you want to believe something bad enough, you can ignore facts. Murphy's book is essential reading for all those interested in economic liberty. As the author rightly points out, politicians and pundits are now eagerly attempting to draw parallels between the present economic crisis and the great depression. 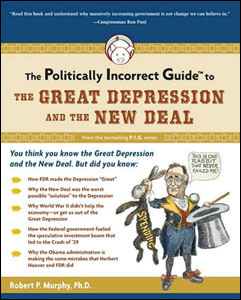 Murphy, in characteristically witty and accessible prose, explodes the myriad fallacies of this great lie, demonstrating that Hoover was a proto-Keynesian, that FDR ruthlessly and artlessly toyed with the U.S. economy, and that WWII absolutely did -not- end the great depression. This work, along with Hazlitt's Economics in One Lesson, was critical in my conversion to Austro-libertarianism. Buy this book. Read it. Study it. Arm yourself against the enemies of liberty.